Newcastle United v Aston Villa Preview: The Boys Are Back In Town! | NUFC Blog. With this in mind, Villa could hardly be arriving at St James’ Park at a better time. United are back in town after three away games on the trot culminating in the win at Blackburn Rovers. 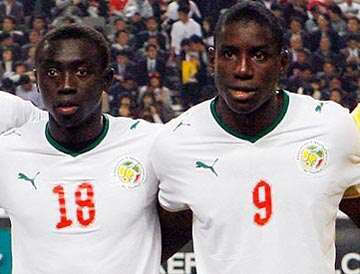 Demba Ba is also back from his exploits with Senegal and is raring to get amongst the goals once again. He’s certain to start. This time of course, we also have his Senegalese strike partner Papiss Demba Cisse in the squad, wearing the famous Newcastle United number nine shirt. We don’t know at this stage whether Cisse will start the game. Manager Alan Pardew has been hinting at allowing him to soak up the atmosphere from the bench first, before unleashing him to what would be a certain gladitorial entrance, the likes of which only a Newcastle crowd can conjure up. It’s a judgement call. Personally, the way the weather is in the North East at the moment, especially the temperature, I’d let him on from the start so he can run around and keep warm! Villa have a good record on the road, having not lost their last 5 games. But then, Manchester United came here with a good away record on 4th January 2012 and left with their tails between their legs after a 3-0 drubbing – so let’s not get too excited about Villa. I’m sure Alan Pardew would say “it’s important to concentrate on what we do and make sure we take the game to them” or words to that effect. The other thing of note to say about Villa’s visit is that we expect to see Shay Given return to St James’ for the first time since he left at the beginning of 2009. Another Newcastle boy back in town! A great servant to the club and a popular player here, I’m sure Shay will be given a warm welcome back by the Geordie faithful, who will then hope he has a stinker between the posts! “It was great to have them supporting me and singing my name. I know they are always behind me, even when it’s been really tough. The match will be broadcast live on Sky Sports 1. As usual nufcblog.org will be having our match banter feature which will be on this very blog about an hour before kick-off. As stated earlier, Ba and Cisse are very welcome additions to the squad who pulled off that away win at Blackburn. Yohan Cabaye will serve the second match of his totally ridiculous three match ban. Also missing will be the injured Steven Taylor, Sylvain Marveaux, Steve Harper, Sammy Ameobi and Nile Ranger. Cheick Tiote is still on international duty with the Ivory Coast in the Africa Cup of Nations. Newcastle United Likely Squad: Tim Krul (G), Rob Elliot (G), Danny Simpson, Ryan Taylor, Davide Santon, Shane Ferguson, James Perch, Fabricio Coloccini, Mike Williamson, Tamas Kadar, Gabriel Obertan, Hatem Ben Arfa, Jonas Gutierrez, Dan Gosling, Mehdi Abeid, Haris Vuckic, Demba Ba, Papiss Demba Cisse, Leon Best, Shola Ameobi, Peter Lovenkrands. Villa will give a late fitness check to striker Gabriel Agbonlahor, who missed the QPR game with hamstring and back injuries. Other “old boys” of note are Charles N’Zogbia and Stephen Ireland. As we learned in midweek, Habib Beye has now left the club. Aston Villa Likely Squad: Shay Given (G), Bradley Guzan (G), Alan Hutton, Eric Lichaj, James Collins, Carlos Cuellar, Richard Dunne, Stephen Warnock, Nathan Baker, Barry Bannan, Ciaran Clark, Stilian Petrov, Stephen Ireland, Marc Albrighton, Darren Bent, Robbie Keane, Gabriel Agbonlahor (? ), Emile Heskey, Charles N’Zogbia, Andreas Weimann, Andy Marshall, Daniel Johnson, Gary Gardner, Enda Stevens. Alex McLeish:“That’s what I want to do [climb the table]. I’ve got to trust the players on the pitch to do that for us and they are certainly within their capabilities. We’ve thrown a lot of points away already so I’m encouraged there is still improvement potential in this bunch. It’s been a bit of a mixed bag. There were definitely points that got away. Can’t see anything but a home win for United here. Anything else would be disappointing in the extreme! We need to be wary of Darren Bent and Robbie Keane however, both of whom can score a goal from nothing on their day. What do you think? Comments welcome below. could you sound any more bitter towards villa? I said what I think. The 6-0 in August 2010 paid them back really, but the memories linger on…. Ivory Coast into the semi finals. Still a long wait for Tiote back then. Let’s keep our fingers crossed that the Dembas play together well. 2 goal scorers could spend lots of time getting in each others way. My snese is AP will have a way to set up on the pitch, and then hope they follow the plan. Slightly off topic but I had a pretty amazing day last Wednesday. I’m from N.Ireland but managed to get a work trip arranged around the game.. It turned out that the team were staying (not overnight, travelled down that morning then headed to the game from the hotel) at the same hotel as me. I was leaving the hotel after work to head to the game and the players were getting on the coach. Got to shake hands with most of them wishing them good luck and also Pardew. Then after the game I was in the hotel but unfortunately the coach must have headed straight back to Newcastle. However was surprised when I was in reception and Colocinni walked in! Managed to get him to sign my shirt and got a photo with him. He was in a taxi so must have been heading somewhere different than the others or forgot something and had to make a detour. Seemed to be in a bit of a rush but took the time to get the photo and sign my shirt. Top player and top lad. the coach picks them up at airport and takes them to the hotel. they drive to Newcastle airport and store their cars there until they get back. im guessing collo probably left his ipad there and got a taxi to the hotel, he would probably be rushing back to get his flight. he was off to Argentina to talk with his agent. He was with some guy, not sure if it was his agent but the guy was speaking with him in Spanish I think. Of forgot to mention the coach was Tynedale so presumed that was a Newcastle company? tynedale is a north east company. the boss of the company actually drives the coach for free. Hugh de Payen leads the charge so far with 32 points but he’s the gaffer of the competition so he doesn’t count. Sir Jason Gloomndoom is the real leader so far with 30 points, Rob Averies is in second with 29 points and finally, maze202 and Derek Llambias are in joint third with 27 points each so far. C’mon Worky, just coz Hugh, the prediction leader, happens to be the gaffer, doesn’t mean he’s disqualified. That’s almost like stripping of his knighthood! has to be looking like a toon win, with perhaps a slight scare… 3-1 the toon. one from demba, one from obatoon and one from a colo! Demba Cisse Newcastles no 9!! Looking forward to seeing a number 9 on a black and white shirt…been a while! Let’s hope it is worth the wait. “Looking forward to seeing a number 9 on a black and white shirt…been a while! Hasn’t bothered at all SJT, if anything, this “number 9 shirt” stuff is a negative thing for the club. Congratulations on topping the prediction league BTW. I know Hugh’s slightly in front but you’re in the first prize position for the moment. Is there any pitch inspection? I haven’t seen or heard anything about a pitch inspection HullGeordie, just warnings that travel may be disrupted. Come on lads, lets have the 3 points today, especially after the mackem’s beat stoke yesterday :-( I reckon the mackem’s should bring back the ugly dinner lady! Haha my spell at the top will be short lived Worky-trust me on that!